Each year, White Flower Farm hosts a series of lectures and special programs featuring staff members and well-known horticulturalists. 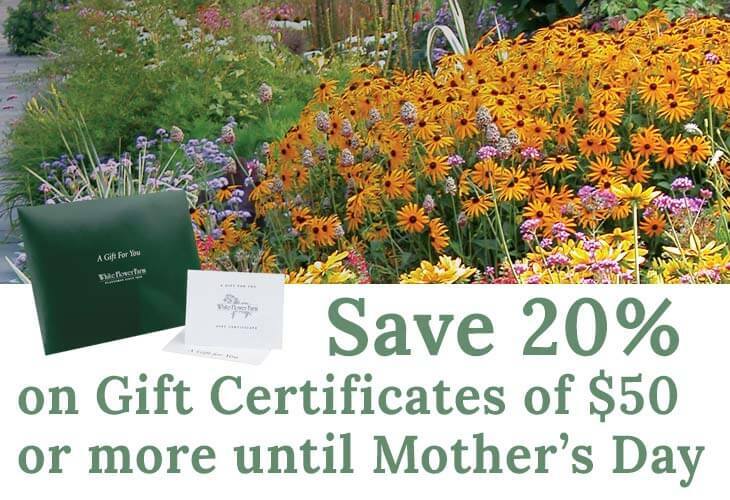 You'll have fun learning, talking with White Flower Farm staff, touring our display gardens, shopping from a special selection of plants, and visiting scenic northwestern Connecticut. All talks are held rain or shine in our lecture hall, which is located up the hill behind our retail store on Route 63 in Morris, CT. Lecture attendees may drive up the hill to park closer to the event. All lectures and workshops start at 10 a.m., unless otherwise noted, and take place in the Farm’s lecture room located in the upper parking lot. Most events are free. If not, the fee is noted next to the event. Join in the fun as we learn the ins and outs of successful baking using herbs and fresh fruit. We’re pleased to collaborate with Litchfield’s newest bakery, The BakeHouse, to give you tips of the trade for baking an assortment of breads and treats. Owners Jeremy McKendry and Allison Varian will show us how to create a home-baked bread with herbs, and a blueberry-filled cake with a raspberry topping – delicious! Better yet, they’ll have an assortment of samples to taste, and each attendee will go home with bread dough to bake at home! Don’t miss this mouthwatering event, seating is limited. Fee: $15 per person. Registration required. Celebrating the 5th anniversary of our most popular event, we invite you to bring your mom or a favorite relative or friend to the farm to have fun creating your own patio pot full of colorful annuals. A store associate will walk the greenhouses to create a custom design with you. Our staff members will then pot up your selected plants while you wait! You’ll go home with a creation to make family and friends jealous of your talents. Fee: $45 per person, includes 1 pot, 5 annuals, soil and labor. Registration is required. Choose any one of the 5 time slots. Each session lasts roughly 45 to 50 minutes. Don’t delay, this event always sells out! Every year in the end of May, White Flower Farm brings its vast selection of Tomato and vegetable seedlings from the greenhouses and puts them up for sale on the lawn next to our Store. We chose this date because it's the ideal time for planting in our area -- the threat of frost has usually passed and it's the best time to get edible plants in the ground to give them the longest possible growing season. The outdoor sale will be held for just two days this year, Friday, May 17, & Saturday, May 18 in the field adjacent to the White Flower Farm Store. On offer will be more than 100 varieties of Tomato seedlings, including treasured Heirlooms and top-rated modern hybrids (all non-GMO), along with everything else you’ll need for your kitchen garden – from savory herbs and veggie plants to helpful gear and supplies. We're excited to welcome back noted Tomato expert Craig LeHoullier, author of Epic Tomatoes: How to Select and Grow the Best Varieties of All Time. Craig will be on hand for lectures and Q&A on both days. Event hours are daily from 9 a.m. to 5 p.m., rain or shine. Breakfast and lunch will be available for purchase. You are welcome to bring your own wagon or cart to the sale. This year we’re offering over 130 varieties of Tomato seedlings, including treasured Heirlooms and the top-rated modern hybrids (all non-GMO), plus over Peppers, veggies, herbs and berries, along with everything else you’ll need for this year’s kitchen garden. Shop early for the best selection! Click here for a list of Tomato varieties being offered. Please note that this list is subject to change and that we cannot guarantee availability of specific varieties. In addition to plants, there will be a wide selection of fertilizers, mulch, containers, ties, stakes, and more. White Flower Farm's staff experts will be on hand each day to answer your questions. For those looking for more information about growing Tomatoes and other vegetables, there will be lectures and demonstrations on Friday and Saturday. 10:00 a.m. Tomato expert and author Craig LeHoullier talks about his favorite varieties. Free. 12:00 p.m. White Flower Farm Nursery Manager and Tomato grower extraordinaire Barb Pierson offers Top Tips for Growing Tomatoes and Veggies. Free. 1:00 p.m. Tomato expert and author Craig LeHoullier talks about his favorite varieties. Free. 3:00 p.m. White Flower Farm Nursery Manager and Tomato grower extraordinaire Barb Pierson offers Top Tips for Growing Tomatoes and Veggies. Free. 12:00 p.m White Flower Farm Nursery Manager and Tomato grower extraordinaire Barb Pierson offers Top Tips for Growing Tomatoes and Veggies. Free. Please note: if you plan to use a gift certificate or merchandise credit at our retail location, you must bring it with you. We will not be able to retrieve any account information at the event. Start your weekend off with a visit to the farm for watermelon, iced tea and cookies while enjoying a stroll through our many display gardens. Don’t miss the scavenger hunt with prizes for the kids (just ask a staff member for a list of clues), guided tours at 10 a.m. and 1 p.m., and 10% off for veterans and active service members. Added bonus: 3 to 5 FREE annuals with the purchase of any cast stone pottery valued at $100 or more. Beautify your patio or front steps with distinctive pottery, and enjoy the results all summer. We look forward to seeing you! Join our Head Gardener Cheryl Whalen for a talk and tour about our newly installed Rose Garden. Anchored by a specimen Stewartia tree and Pinus stobus ‘Nana,’ the garden is filled with a variety of exciting Roses and companion plants. Cheryl will review how the garden came to be, the trialing of plants installed, and maintaining a garden with organic practices. She’ll demystify all the tricks to successfully growing Roses and show how to tackle the seemingly daunting task of combining plants for a pleasing garden design. All attendees will save 20% on any Rose purchased on Saturday! - Registration required. Fee: $5, benefits the Elizabeth Park Rose Garden in West Hartford. We’re pleased to host CT-based author Lorraine Ballato for a talk and book signing of her newest publication, Success with Hydrangeas: A Gardener’s Guide. Lorraine will lead a lively and informative discussion about the “queen of American shrubs” and sign copies of her book. If you ever needed to have the mystery of growing Hydrangeas explained and your questions answered, this is your chance to dive in with a leading expert. Fee: $15 per person. Registration required. One FREE 1qt perennial for each attendee. Light refreshments will be served.